Submitted by Shannon Pritting (pritting@oswego.edu) on 2008-01-22. Made available in DSpace on 2008-01-22T13:38:33Z (GMT). 2nd Legislative Session 11th Senate Meeting November 4, 1966 Bill 4 To establish a uniform procedure for Conoert Assembly, Festival of the Arts, Sheldon Lecture Series, and College Union Board of Managers to follow if they deem l'pny-as-you-gol' events necessary to continue to promote high quality programs for the college community. Be it enaoted of the Sennte of the Student Association of the State University of New York College at Oawego: I, The Conoert Assembly, Festival of the Arts, Sheldon Lecture Series and College Union Board of Managers may request supplements to their Student Assooiation subsidy on n lfpay-as-you-goll basis under the following provisions : A, B. c. 11. The A. B. C. The request will be made to the Senate Finance Committee at its regular meeting, or immediately to a special Scnate meeting if time does not allow. If the request is projected to supplement the aativityfs subsidy by more than $100.00 the Chairman of the Senate Finance Committee will present the particulars of the request to the Senate along with that oommitteers reoommendation. The Senate will act on the request in the meeting presented. following provisions will apply: The activity may not enter into a contract which will require monies collected on a pay as you go basis unless it has sufficient funds to cover such an event. The maximum amount that an activity may charge for n subsidized event on the pay as you go basis shall not exceed $2.00. An activity may not charge on a pay as you go basis formore than three events each academic year. If there is a double performance by the srune performer on the same day, this shall be counted as one event. (Resolution 2 Continucd) Whcrcas: many studcnts aro ignorant of th~ courses required for th~ir curricu1um and, IJhcreas: many students have not b~cn informed of the nmo of thair advisor, Bc it rcsolvcd that each new studcnt be notificd, by means of cur-riculum m~etings or bulletins, of his advisors and requircd courses. 2nd Legislative Session 5th Sonatc Meeting October 3, 1966 Resolution 1 ION Bc it rosolvod this, the third day of October, 1966, that: 1, We, as olcctad roproscntativ~s of thc student body of Oswego Stata, do hcroby roquest the attorncy-general of thc State of NGW York, to conduct, or hav~ conduotod, an investigation into tho affairs of the State University Colloge at Osw~go Dovelopncnt Association, and to subsequcntly lay baro tho facts of its operation to the gonc~al publio, inoluding its scopc of activities, its purposes, and its f inancial structure. We tho students bolisvo that a public appraisal of this private corporation is, at this time, important, not only to Oswogols Faculty and Students but to the taxpayers as well. Signed, Pr~sident of SeAq., Vice-Prosidcnt of S.?., Sanators 2. Bo it furtber resolved that copics of this request be sent to Governor Rockcfcllcr, Democratic Gubernatorial candidate Frank D. O!Connor, State Senator John Hughos, Assembly Spcakar Anthony Travia, Senato FIajority Leador Earl W. Brydgcs, Scnator HI Douglas Barclay, dssembl~n Edward F, Crawford, nnd to the S.U.C.O. Development Lasociation, and President James Pcrduc, S.U.C.O. Bo it rccomcnded by the Rules and Procedures Committee of the Student Lssooiation that the, following rulcs and procedures for the operation of tho Senate bo adopted. Rule I Prosidont Pro Tompore Section 1, The President pro tompore shall be a voting member of tho Student Senate and shall be elected by a majority of tho Senate by a socret ballot. Section 2. He shall take charge of all V2oe Presidential duties in the absence of tho Student Body President, Section 3. He shall vote in all business before tho Senate, but shall vote last when be is presiding, Rule I1 T orripor ary Chaimnan Seotion 1, The Vioe Prasident shall have the right to nmo a nomber; of tb~ Senate Tom~orarv Cbairmn in the event that both he and the President pro tempore will be absent from a meeting of the Student Senate, but such appointment shall not extend beyond adjournment of that meeting, Section 2, During his appointment bs shall have all powers of the President pro tempore, Rule I11 Legislative Secretary Section 1. The Legislative Secretary shall prepare suoh memoranda and other material as the Senate or the Student Body Vice President may direct, Section 2, The Legislative Secretary shall prepare copies of all Bills, Resolutions, and Rec mendations and deliver the same to the member3 of the Senate. Section 3. In the case of the absence of tho Legislative Secretary, be will be replaced by a member of his staff selcoted by him with the approval of the Vice President. Rule IV Parliamentarian Section 1. The Parliamentarian shall be appointed by the Vioe President, Section 2. He shall serve as the Presiding Officergs advisor and consultant on procedural mat tors. Section 3, ,111 questions of procedure shc'; be directed to the Presiding Offioer who may consult with the ~arlimentarian-before ruling ok the question. The opinions of the Parliamentarian have advisory power only. 7) provided the student does not claim without (Confit) authority to speak or act in the name of the University or one of its organizations, 8) The University shall endeavor to develop in its studenta the realization that all citizens not only have the right but the obligations to inform themselves about problems and issues of concern to the community and the nation. It shall encourage students to formulate points of view regarding these issues and give expression to them, 9) In discharging the rights and obligations of citizenship and in exercising freedom of expression, students must also recognize their responsibilities to other individuals, to the University, to the atate, and to the nation, and to society in general. Orderly and dignified expression and conduot shall be expected. 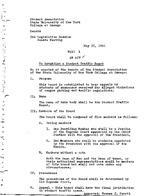 The Student Senate recommends that the foregoing resolution be adopted by the proper authorities of the University, 2nd Legislative Session 20th Senate Meeting March 6, 1957 Resolution 9 Be it reaolved of the Student Senate of the State University College at Oswego: That my law passed by the Student Association may not become effective retroactively.